The U.S. is definitely a society accustomed to instant this and disposable that. While not very “green,” it sure is convenient. If we don’t feel like washing dishes, we can use paper or foam plates and toss them after one use. We no longer have the milkman deliver to us in glass bottles that we then return the following week. Rather, we get plastic jugs from the supermarket and then add them to the landfill when empty. When thinking in terms of an extended situation without these conveniences, we need to consider options that are more durable and made for repeated use. 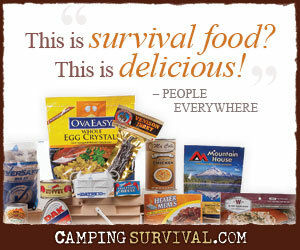 One of the first things I want to address is daily food storage. In a previous posting about mice, I mentioned how imperative it is to keep food in airtight thick plastic, glass, or metal containers to keep creatures out. Those same guidelines need to be applied to your everyday food prep and storage items also. Ziptop bags sure are handy for a handful of crackers, raisins, or whatever. Throwing a little aluminum foil or plastic wrap over your leftovers is standard operating procedure for most people. But what if petroleum products get too expensive or scarce for everyday use in such things? Or there is a situation preventing the regular restocking of the corner grocery store? Do you have any alternatives? This is an area I have been working on. It’s worth noting here, though, that keeping leftovers usually requires refrigeration, so we may get more practiced at cooking “just enough” so nothing goes to waste. A discussion of alternatives to the fridge would be worth a posting in itself sometime maybe. Let’s say you have some leftover cornbread that you want to serve tomorrow with soup. You need to seal it up to keep it from drying out and drawing unsavory creatures. What non-disposable item do you have to put it in? I have been trying to keep an eye out for useful small to medium food-grade storage sets for things like this. Rubbermaid now has some options. I especially like the glass ones since they are least prone to picking up odors or staining (the tops are plastic though). Sterilite makes some plastic ones also. I have seen both kinds available in big box stores. As a cost-saving measure and for practicality’s sake, you may pack a lunch for work everyday. No matter what the future brings, as long as you have days you aren’t at home for a meal, you will probably still need to do this. What kind of packaging are you using? I’ll admit to appreciating the simplicity and freedom of using all disposable things and then wadding it all up and tossing it in the trash so I don’t have to keep up with it anymore. My conscience bothers me, though, and I’d constantly have to obtain new items, from plastic baggies to paper bags. I’ve shifted us over to almost all reusable items. I like the site Reuseit.com. I’ve been pleased with all the items I’ve bought from them except the Lunchskins brand. They are more expensive and stain easily in my experience. Not sure on the durability yet. All have been washable in the clothes washer and dry quickly. The Wrap-N-Mats are nice because they provide a clean placemat surface to place all your food while eating. As for spoons and such, the sturdier “disposable” plastic utensils available at grocery stores have held up through the dishwasher well for me. (We have a large family and packing lunches for our days out can be daunting in the details. I once packed a bib in the 10 year old’s lunch box and none in the baby’s before I got a system down. 😀 . To simplify things, everyone now has a color or pattern that is always theirs and I line up the lunchboxes in order of age. You may want to consider things like this if you are pressed for time or have lots of people to pack for). I spoke of paper plates at the beginning in a derogatory way. I should mention a valid point I have seen made in a few places- if you are in a situation where water is very hard to come by, an argument could be made for using paper plates, bowls, cups, etc. If they are held over to be burned for cooking the next meal, you not only save water (that would be diverted for washing rather than drinking), but have good tinder at the ready. I have heard that some group retreats require its members to stock thousands of paper dishes per person. I love Tupperware and own tumblers with lids, cereal bowls with lids, and the snack cups with lids. All glass that comes into the house is saved for reuse for leftovers. Straight-sided canning/freezing jars are a favorite for freezing, leftover in the refrigerator, and taking water with me to drink. It is possible to eat from pie pans that are metal and indestructible if a person does not want to carry paper plates to a different place or breakable plates are too fragile and heavy. Paper plates have their place. Soon, after surgery, paper plates will be my choice of plates. But, I got them free through a survey. They are very heavy, so I won’t be spilling things. I did not know the requirement/suggestion about having paper plates. There is no plastic mice cannot eat through in my opinion. That’s funny about the bib in the older child’s lunch. i grew up on a farm in the 60’s and 70’s. my grandmother would cook a small breakfast that would be eaten up, but she cooked a monster lunch. after lunch she would leave the food in pans and plates on the stove top and cover it with a table cloth. we would come through all day and munch on biscuits, fried chicken, everything, and usually dinner would include some of those leftovers. on many occasion some of those leftovers would be there in the morning and get eaten for breakfast. we drank raw milk and well water and I am sure we had some healthy host bacteria in our bellies, I never got food poison until I went off to college and started eating in restaurants. probably keeping foods like that will be fine for leftovers if they are to be eaten in the next couple of meal periods. You know, I think you are right. That kind of thing is strictly forbidden by law in the food service industry and I’d be really careful about it if the ingredients included mayonnaise, but I’ve never known anyone to get sick doing this at home either. I’ve often wondered about things like baked goods. If the container of frosting says it must be refrigerated after opening and still used within something like 5 days, then why doesn’t anyone refrigerate the cake? (Yeah, homemade is WAY better, but it’s just an example). I think your point about restaurants is a good one. I’ve had food poisoning twice- both from restaurant food, never been even mildly sick from home cooked or canned. I need to update this. After using the sandwich and snack bags from Reuseit, I should amend what I said before. The ReUsies brand they carry are not holding up well. I’ve washed them very gently, air-dried them, and so on. They faded immediately and both the cotton and nylon fabrics are very thin. The seams have already pulled away on one too. I recently placed another order with Reuseit and got all Lunchskins bags. They are the most air and water repellent ones out of the 3 brands I got. They do stain on the inside, but that doesn’t matter much to me. I also got a fantastic thermos from them. Joe recently ended up having a lunch meeting with a client, so he didn’t eat the lunch I had packed, which included the thermos of soup. The next morning, I opened the thermos and the soup was still warm 24 hours later!! I had filled the thermos with boiling water while I heated the soup, but still I thought that was amazing! It’s a bit expensive, but will quickly pay for itself in meals not eaten out. Also, would be good for sitting in a deer stand.